Gr 8 Up –This year marks the 50th anniversary of Loving v. Virginia, the landmark Supreme Court case that struck down laws barring interracial marriage. POWELL, Patricia Hruby. 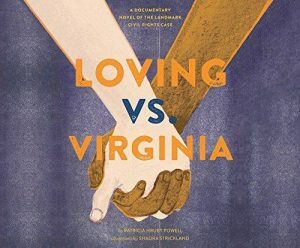 Loving Vs. Virginia: A Documentary Novel of the Landmark Civil Rights Case. 3 CDs. 3 hrs. Jan. 2017. Dreamscape. $29.99. ISBN 9781520052625.